For fall the Lanvin woman has gone a bit hard, with long jet black tresses, shoes that seem to be made of crude oil and severe silhouettes that are femininity at its best. A little black dress with exaggerated shoulders. Another little black dress with an asymmetric long sleeve that wraps around both shoulders. Worn with one leather glove to match the sleeve (secretopulence). 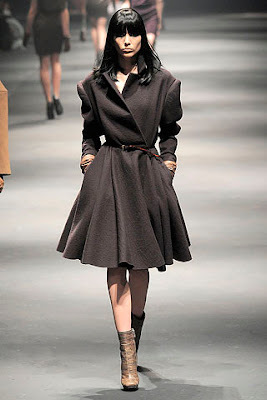 Narrow coats worn as dresses and dresses that feel like deconstructed jackets made into the dresses while on the run. This is probably the best jumpsuit I've ever seen in my life. 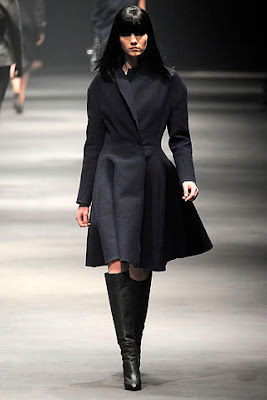 The "new look" look, makes an appearance at Lanvin too in a beautiful devoid-of-details save for a swooping skirt navy coat. 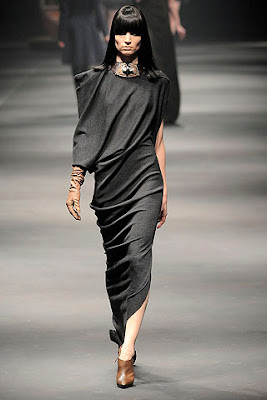 A flawlessly draped asymmetric gray maxi dress hugs the body in all the right places and it's extra loose at the top. A geometrically-structured camel coat. You gotta be a whole-lotta-woman to pull of those INSANE sleeves. Another 50's dress makes in an almost drab brownish-grey (but it's ALL part of the LOOK). 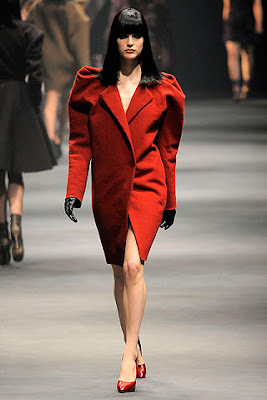 For the not-so-faint-at-heart, Alber offers a bright red coat with his signature quasi-mutton sleeves. The king of woman-dressing would not let us go without a short, heavily beaded dress. Every time I see pics from this show the song Father Figure by George Michael comes into my head, not that it's a bad thing, Tania Coleridge is/was a stunner. i love the coats, there just tooo gorgeous!